Babes Ride Out Artist Series highlights the talented people in our community. Every artist donates their time and creativity to create a custom piece for the BRO5 Raffle. We are so happy to be able to support Moto F.A.M. through the proceeds of the raffle each year. Moto FAM raises funds for riders that have been hurt in a motorcycle related accident, or the family of a fallen rider. Thank you so much to Lowbrow Customs for contributing the Gas Tanks for the Artist Series this year! We really can't say enough good things about our friend Joel! We are so thankful to be able to feature his beautiful work in the Babes Ride Out Artist Series for the past 3 years! 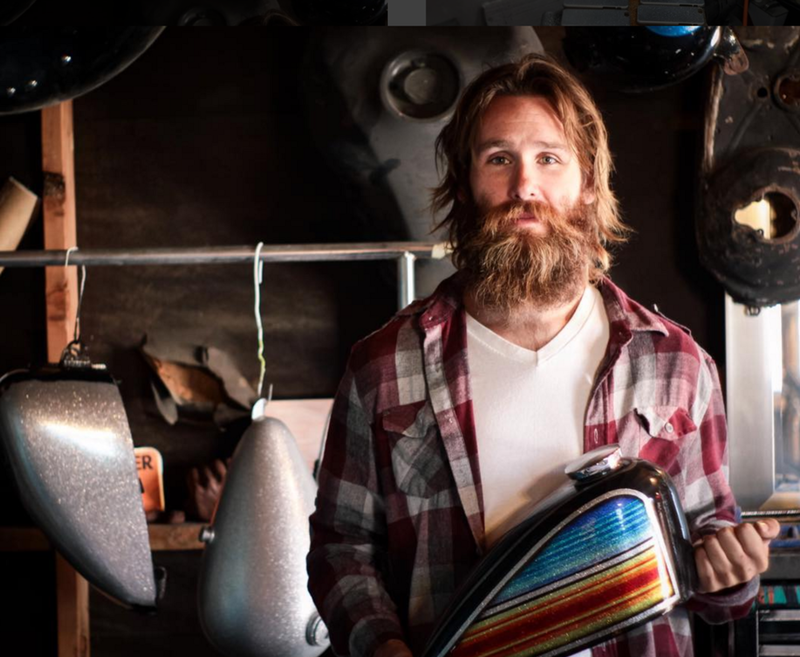 Get to know the man behind 845 Motorcycles! What first got you into art? I never really was into art growing up or even as an adult. I wanted to paint a gas tank for myself and starting looking at 70’s custom paint and fell in love with that style. That sparked my interest in the art of custom paint. How would you describe your style? My style is heavily influenced by 70’s custom paint. I tend to lean towards heavy contrast and bold colors. What inspires you? Have any artists in particular been an influence on you? I take inspiration from modern graphic design, especially street art and tattoo art. I even draw from the glass blowing world, I love the work and am inspired by Marble Slinger. What is your favorite medium? Really my only medium is automotive paint. Never really have been interested in much else. When did you first hear about Babes Ride Out? I heard about BRO about 3 years ago when I moved to the Joshua Tree area. I was stoked there was such a cool event here but sad it was one I couldn’t attend. What is your connection to the motorcycle community? I paint motorcycles for anybody in the community that wants my work. I try to attend and even sometimes have booths at any event I can make. Do you ride? If so, what do you ride? I ride a few different bikes but my favorite is my 95 Sportster. I have put a ton of work into it to make it how I think it should look. But having said that I call it a Mr. potato head bike since I am super ADD with it and change it constantly. It’s hard not to keep all the tanks I paint and put on my bike. If you were a motorcycle what kind would you be? I would have to say I’d be an early 80’s Honda enduro. Down to go anywhere but not especially fast and kinda heavy but fun to ride and will run forever. Have you ever been to Joshua Tree? What was your experience there? I loved it so much I bought a property and live here. It’s just a magical place and affords me the space to work and play. What will you be contributing to this years raffle? I will be painting a lowbrow gas tank. Not sure what I’ll do it but you can bet it’ll have lots of sparkles. I would like to thank Anya and Ashmore for asking me to be apart of this. I am honored that I get to contribute to my art for a 3rd year. It’s a very special event run by very special people and I am stoked to be able a small part of such a rad thing.